Nenè La Scalinata Accommodation is located in the main centre of Bellagio on one of the main staircase, Salita Mella, at the number 21 (the star on the map shows where the apartment is). 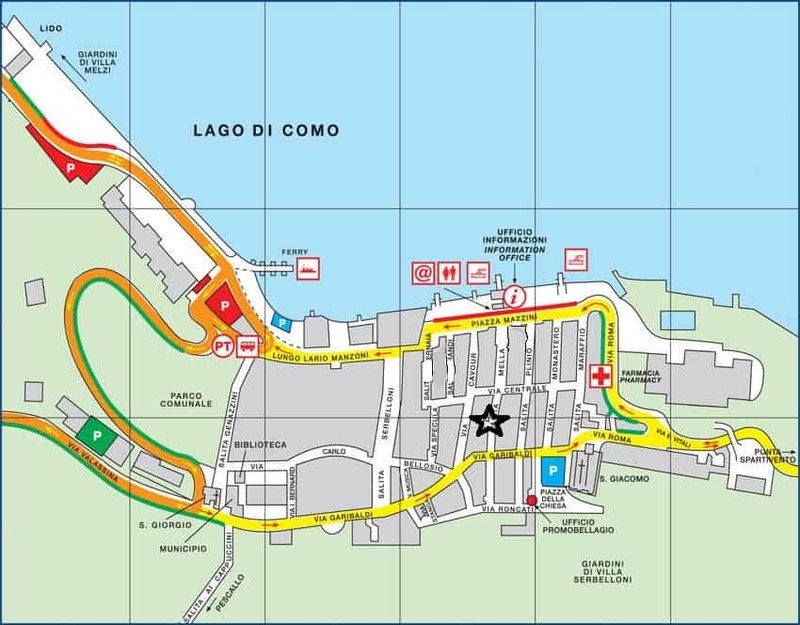 By car: You can drive into Bellagio centre and park in Piazza della Chiesa (the blue parking you can see in the attached map), the church square at the end of Via Giuseppe Garibaldi. Even if the centre is a limited traffic area our guest can access, we just have to communicate the car’s plate, model and type. Public transport: Bus, ferries, speed boat.. all public transport arrives few meters away from our apartments in Bellagio centre. Nenè Il Vicolo Accommodation is spread out in the little hamlet of San Giovanni. San Giovanni is an ancient fisher village and a quiet hamlet of Bellagio, all the hamlet is a pedestrian area with 2 free beaches, a baby play park and a really nice square along the lake. CAR: the address for the GPS is Piazza don Alfredo Miotti, 1, a free car parking 30 meters away from our facility. From the square you can walk to Via Sant’Abbondio, 13, and ring the Architecture office bell (on ground floor). BUS: 200 meters away from our facility there is the C30 bus stop. The name of the stop is Guggiate: better ask to the bus driver to stop there. FERRY: during the summer season there is a midlake shuttle that stops directly in San Giovanni hamlet 4 times per day. TRAIN: during the summer season there is a turistic little train that from 9am untill 7pm pass through all the hamlets of Bellagio.